Offering simple hand-propulsion and combining a compact 40cm cut with a highly efficient 99cc OHV engine, the attractively-priced Webb WER40HP will prove a great choice for those looking to make their first foray into the world of petrol-driven lawnmowers! Quality features include a steel chassis for rugged robustness; single-point cutting-height selection for ease of use; and a fold-able handlebar for convenient storage. This mulch-capable model weighs just 22kg and is supplied with a 50-litre collector. 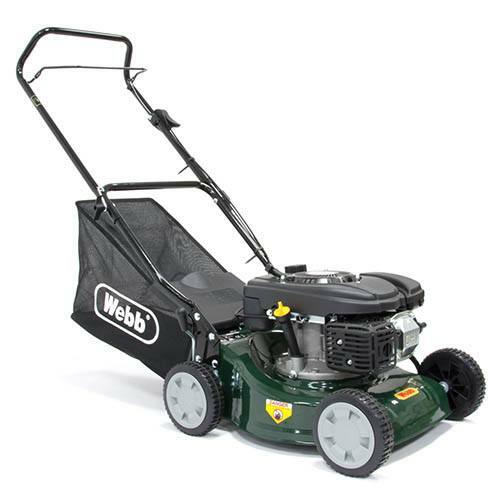 If your looking to make the step-up from your old, under powered mains-electric machine, this affordable, entry-level petrol rotary-mower from long-established UK brand Webb is certainly worth a look! Supplying the power is an impressively efficient 99cc Sanli four-stroke air-cooled motor, which, thanks to its employment of the latest overhead-valve technology, will prove clean-burning, quiet in operation and cheap to run. With its compact dimensions and straightforward push-type design, the 40cm Webb WER40HP Petrol Rotary Lawnmower is highly manoeuvrable and will come into its own on smaller lawns where there are obstacles and awkward corners to negotiate. A steel mower-deck provides a solid cutting-platform and ensures bumps and bangs won’t be a problem; while single-lever height adjustment - from the seven positions available - makes the pre-mowing set-up quick and easy. The Webb WER40HP Hand-Propelled Petrol Rotary Lawnmower can either collect or mulch grass-clippings, with both modes leaving behind a neat, debris-free finish. This model’s collapsible fabric grassbag (50-litres) and fold-down handle work to make transport and storage hassle-free.